Reginaldo F. Del Valle, 1913. As an L.A. Water and Power commissioner. 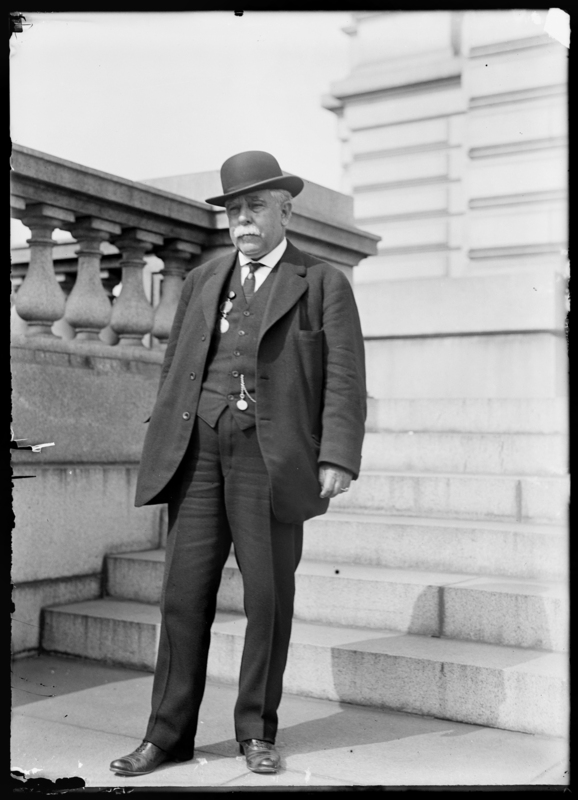 Photograph (glass negative) by Harris & Ewing, from the Harris & Ewing Collection in the Library of Congress. Reginaldo Francisco del Valle, son of second-generation SCV landowner Ygnacio del Valle, spent his formative years in the Santa Clarita Valley, chiefly at the Del Valles' Rancho Camulos. He represented Los Angeles County in the state Assembly and Senate, and served for two decades as a member of the commission responsible for bringing Owens Valley water to Los Angeles. Among his legislative successes was his work to help establish the institution that became UCLA. Among his failures was his unsuccessful effort to split the state in two, at a time when state politics were heavily dominated by northern influences — explaining both the rationale behind his effort and the reason for its defeat. Reginaldo, aka Reginald, was born December 15, 1854, to Ygnacio (1808-1880) and Ysabel Varela (1837-1905) del Valle, in their home on the Plaza de Los Angeles. Ygnacio was heavily engaged in Los Angeles politics at the time; after serving in the state Legislature at statehood in 1850 he was elected to the L.A. City Council in 1852 (terms were 1 year back then) and held several other official city positions through 1859. Around that time, circa 1859-61, the family repaired to its property north of Los Angeles, which Ygnacio's father Antonio had been granted in 1839 — the 48,829-acre Rancho San Francisco, which stretched from the Piru area on the west to what is now western Canyon Country on the east. Here, Reginaldo was raised — in the most trying of times for the family. The three-year drought of 1862-64 decimated the Del Valles' livestock and they lost the farm, literally, to the bank in 1865. Gone was their Rancho San Francisco; all that remained were the westernmost 1,000 acres known as Camulos (which wouldn't be "discovered" and celebrated as the mythical "Home of Ramona" for another 20 years). In 1867, Reginaldo went off to high school in Los Angeles at St. Vincent's College, which later became Loyola Marimount University. After graduating from high school with honors in 1871 he went north to Santa Clara University, a Jesuit institution. He graduated in 1873 and studied law apparently while clerking in a San Francisco law office. He passed the bar in 1877 and was admitted to practice before the state Supreme Court at that time. A short while later he was elected to the California Assembly. (It is unclear whether he was first elected in 1879 and reelected in 1880; in any case he was elected in 1880). In 1881 he was nominated for the speakership and lost by four votes. That same year, he introduced legislation to establish a normal school (a college) in Los Angeles. Ultimately someone else's bill came to the floor for a vote, but the result was the estabishment of a normal school that eventually turned into the University of California, Los Angeles. It was widely understood to be Reginaldo's idea. The next year, 1882, he was elected to the state Senate from Los Angeles County. Just a freshman senator, he was elected president of the Senate — at 28, the youngest ever. He served until 1886. Meanwhile he was active in Democratic Party politics. In 1880 he was an elector for W.S. Hancock (who lost his presidential bid to Republican James Garfield), and Reginaldo ran unsuccessfully for Congress in 1884. In 1888 he chaired California's Democratic Party convention and in 1890 was the Democratic nominee for lieutenant governor (he lost to Republican John B. Reddick). In San Francisco on Sept. 2 of that year (1890) he took a bride, Helen M. Caystile. She was the widow of T.J. Caystile, co-owner of the Mirror Co., a printing plant in Los Angeles. Back in 1881, Caystile's Mirror had essentially foreclosed on one of L.A.'s many little newspapers, the Los Angeles Daily Times. Caystile's partners insisted on keeping it going, and they brought in a Santa Barbaran named Harrison Gray Otis to edit it. They eventually removed "Daily" from its name. With the marriage, Reginaldo adopted the Caystiles' daughter (also named Helen). Reginaldo and (his wife) Helen had another daughter together, Lucretia del Valle. Turn up the clock to 1908 and the Los Angeles Times principals are heavily involved in the importation of water from the Owens Valley. In that year Reginaldo, now an L.A. lawyer with an office in the Lankershim Building on Broadway, began 21 years of service on the city of L.A.'s Public Services Commission, aka Water and Power Commission. His most enduring achievement in that capacity was to mollify outraged Owens Valley farmers who didn't want to see their historic water supply siphoned away. The Los Angeles Times said of Reginaldo: "To him, as much as to anyone, Los Angeles owes the mighty aqueduct that was built to tap the water of the Sierra." For all the civic improvements that commanded his attention across a lifetime that stretched from the old rancho days to the development of a bustling metropolis with streetcars and multi-story buildings, Reginaldo had a hankering for history. He well knew journalist and historian Charles Lummis (what L.A. mucky-muck didn't?) and was a founding member of Lummis' Landmarks Club, which goal was to salvage the crumbling Spanish missions. Reginaldo was also one of the 40 founding members of the Southern California Historical Society, and it was Reginaldo's idea to install lookalike mission bells along El Camino Real. Reginaldo died September 20, 1938, and was buried in Calvary Cemetery at 4201 Whittier Blvd. in East Los Angeles, where his parents were laid to rest — eventually. Ygnacio was buried at Camulos, but when Ysabel was close to death in 1905 she had his remains moved to Calvary Cemetery. On her instructions, she was buried in the same coffin. LW2532: 19200 dpi jpeg from 246MB tiff | Online image only.